Easter Coloring Books make great additions to an Easter basket, or even given as a singular gift for Easter. You may also wish to include colored pencils or complimentary stickers with them. Everyone enjoys coloring. There are even books made with adults in mind these days. That is simply because coloring is such a relaxing pastime. When a child, or adult, has finished a pretty picture, they can remove it from the book and give the colored picture as a gift. You might just be fortunate enough to be the recipient of such a lovely treasure. I have always liked to display my children’s artwork on our refrigerator. I have a special binder with plastic sheet protectors where I keep their art when it is retired from the fridge display. Bunny rabbits and Easter eggs are always a favorite, but spring flowers make beautiful Easter pictures too. The pictures in these books would be delightful to color. Smaller hands will probably prefer crayons, while teenagers or adults would want colored pencils. Kids will have hours of fun creating beautiful artwork with these gorgeous books. Spring flowers are not just for Easter, but they are definitely appropriate for Easter! I am always amazed by a child’s imagination. Since they don’t have preconceived notions about what color a particular flower should be, they come up with some really unique and pretty pictures. A lot of children really love butterflies, bees and other insects. A book that combines flowers and insects is perfect for springtime art. Plus, this coloring book makes a bright and pretty addition to an Easter basket. Peter Rabbit is adored by all generations. Even children who are not yet familiar with the story, love the dressed bunny in the blue coat. This particular book is both a storybook and a coloring book. 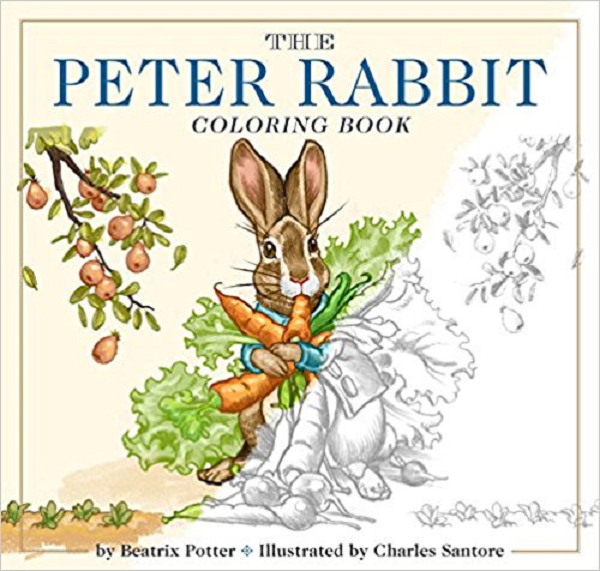 On the left side, you can read the actual Peter Rabbit story to your child, or they can read it themselves depending on their age. Then, they can color the picture on the right side. I do recommend using colored pencils for this book to prevent the wax from crayons rubbing off on the storybook pages. But, either would be fine if you don’t have colored pencils handy. Peter Rabbit has always been a favorite of mine. Your suggestions to use coloring books and art supplies (crayons or colored pencils) for an Easter Basket is a terrific idea. The gift will last long after the candy is gone, extending the holiday spirit for children. I always tried to add a toy or gift to the candy in my children (and now grandchildren’s) Easter Baskets. Makes the day extra-special for the child(ren).